I realize that despite being around for years, the social network remains a mystery to many people. 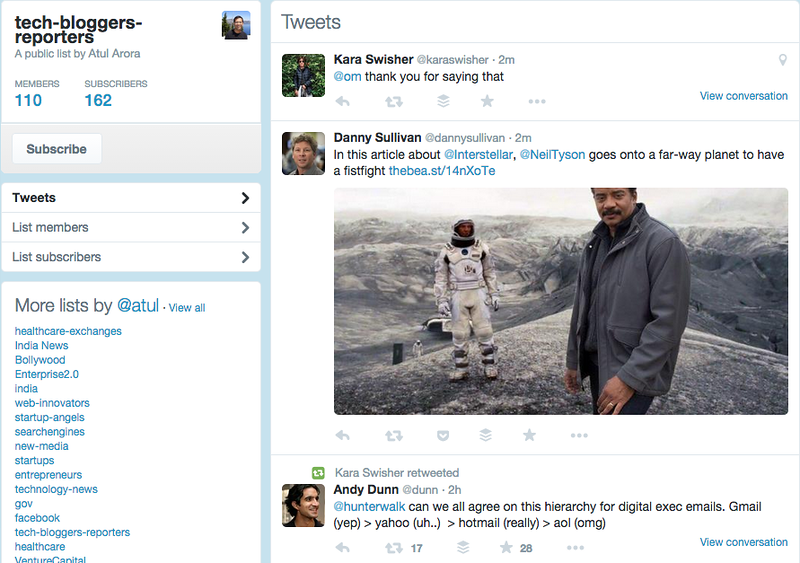 So, here is an article to help you master the basics and use Twitter like a pro. On Twitter, the following process is topic-based and is done without a user's approval or the need for reciprocation. On Facebook, it is all about friends/family and social interest. Tweets (Twitter messages) are limited to 280 characters, while Facebook allows 63,206 characters per update. Tweets have a shorter lifespan than Facebook updates. Facebook users want to read, discuss and share content that pertains to their direct line of interest. Tweeps, on the contrary, are more into global trends and short conversations. 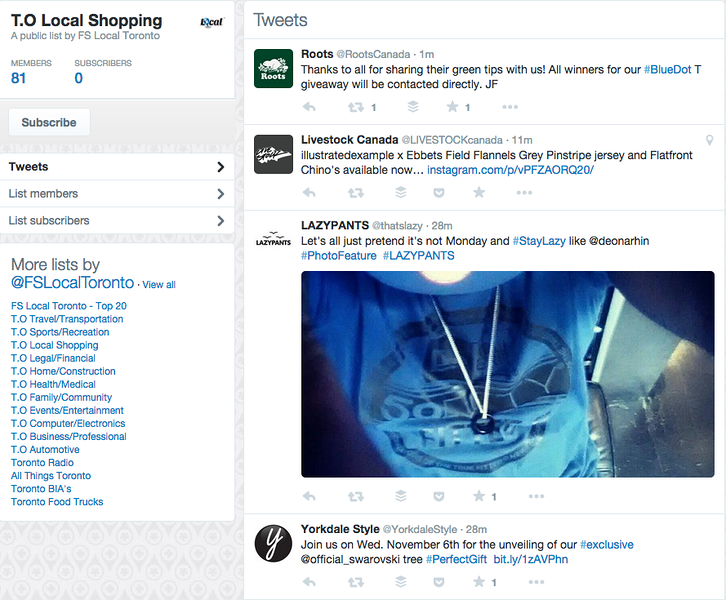 There is no filtering of the newsfeed on Twitter. You see Tweets at the exact time when they are posted. Whether you own a business or represent yourself, remember to always put your best foot forward. A logo may be a step in the right direction, but people are more likely to follow you if you show your face. Aim for a professional, yet friendly photo. Recommended size: 400 x 400 pixels. Your image is automatically resized to ﬁt. A picture is worth a thousand words, right? Well, this is the perfect place to prove it! Recommended size: 1500 x 500 pixels. Tools to create an attractive header: PicMonkey and Canva. They are both free (with paid options). People will not just follow you because of your nice profile picture and header. They will also want to know who you are. On Twitter, you have 160 characters to make a good first impression. So, don't waste people's time. Describe yourself and what you have to offer in a simple and concise manner. Think of it as an elevator pitch -- with a friendly twist. In a nutshell, make it inviting instead of trying to show off. Rebekah Radice: "Social Media, Digital Marketing Strategist, Author, Blogger, Keynote Speaker, Co-Founder @Imagine_WOW | Coffee addict, sunshine lover & nuts about my 2 pups!" SearchEngine Journal: "Helping marketers succeed by producing best-in-industry guides and information while cultivating a positive community." Doreen Pendgracs: "Professional writer. My niche: chocolate travel. My book: Chocolatour: A Quest for the World's Best Chocolate. Find it at http://chocolatour.net." Katrina Moody: "I'm a geeky girl who loves building with Wordpress and creating awesome designs! I might be addicted to social media and coffee!" Don't forget to include your location and the link to your website or blog. They will appear under your bio. 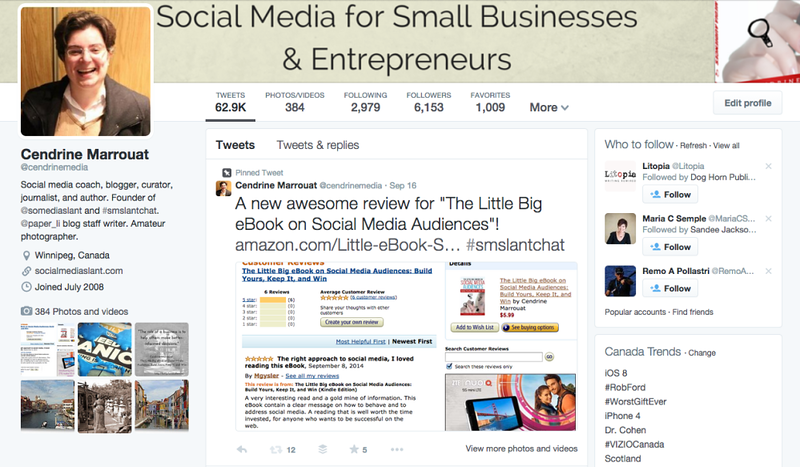 Do you know that you can now prominently feature one of your Tweets at the top of the your profile timeline? What a great way to draw people's attention to an important message or announcement! 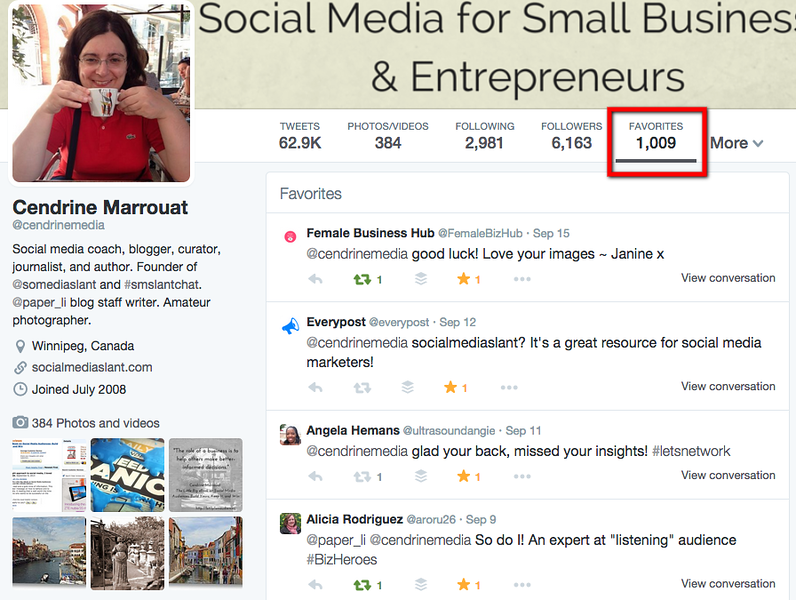 To pin a Tweet, click the "more" option on the Tweet and select "Pin to your profile page." In my book, favoriting is more than a seal of approval. It is also a way to 'vouch' for someone's words. UPDATE: Favorites are now called Likes. Save time by organizing the stream of information that you see. Show gratitude to your audience. Lists are also an extension of a brand. When subscribing to and/or creating them, focus on relevancy and quality. Why? Because the better content they feature, the more trust you will build around your brand. In the case of the Lists you create, remember that you can always make them private. They will only be accessible to you. Nobody likes following an account that only has a few subscribers compared to its following number. Why? Because it usually is "run" by a spammer. Follow fewer people than you have have subscribers -- or at least keep a balanced ratio. Make sure you follow people who are relevant to your niche. According to Buffer, Tweets with images receive 18 percent more clicks, 89 percent more favorites, and 150 percent more RTs. Impressive, right? While I strongly encourage you to share as much visual content as possible, stick to relevancy no matter what. Your Twitter profile has a dedicated "Photos/Videos" section. So, share responsibly to ensure that your brand's story remains consistent. 2 a.m. on March 11, 2011. I was checking my Twitter stream, when I suddenly caught the first Tweet about the earthquake and tsunami in Japan. Within minutes, my entire news streams was exploding with information, pictures, videos, donation links, and emotional conversations between people who had never talked to one another before. I stayed up all night to witness this incredible wave of generosity. I will never forget it. What I have just described is one example of what happens daily on Twitter. Twitter is where caring people hang out. Try to keep that in mind when you use it. Be helpful. Do your followers have questions in a field where you could of assistance? Answer them. Do you know someone who could benefit from your content? Mention them in a Tweet with a relevant link. Keep it 80 / 20 - Dedicate 80-90% of your time sharing relevant and compelling content and engaging followers. You can use the remaining time for self-promotion. Argue violently with belligerent users. Settle things peacefully and/or privately and know when not to respond. Many businesses use Twitter for customer service, because the platform makes it easy for their teams to access mentions and Direct Messages. Dell and KLM are two of the best examples. Easy organization of streams, lists and searches. 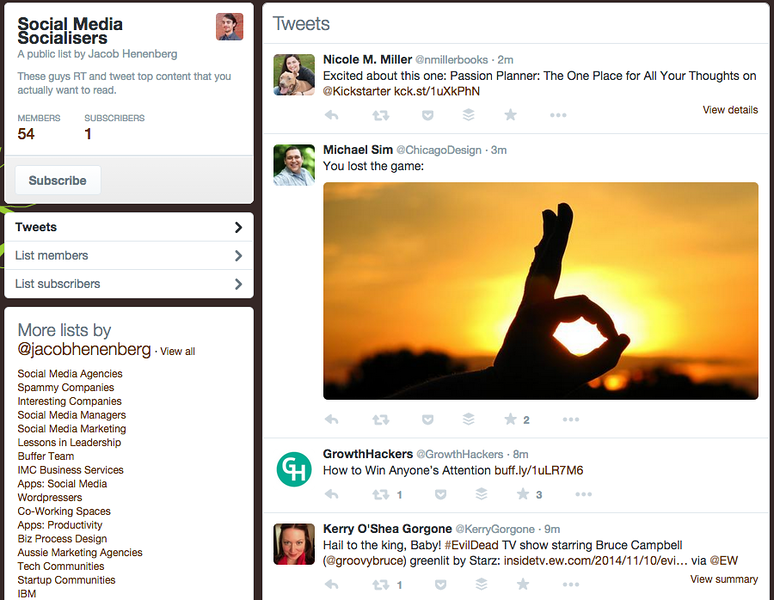 Option to connect and monitor several Twitter accounts within the same dashboard. Notifications of replies and DMs. One of the best ways to make you and your content easier to find on Twitter is to highlight relevant keywords in your tweets. This process is called a hashtag. According to Whatis.com, "A hashtag is a tag used to categorize posts on Twitter (tweets) according to topics. To add a hashtag to a tweet, you just preface the relevant term with the hash symbol (#)." One of the oldest and most famous hashtags is #followfriday (or #ff), which allows participants to recommend the tweeps they consider inspirational or influential. Writers interested in connecting and networking with one another will include #amwriting, #litchat or #writer in their tweets. They use a service like TweetChat to keep an eye on who adds to the conversation. Looking for a great place to find all the popular hashtags at once? Use Hashtags.org. As a business, Twitter is probably one of your most important tools to monitor blogs, trends, news, or influencers in your niche. Unfortunately, as great as the platform may be, following hundreds or thousands of accounts comes with a price: a rapidly changing timeline. You may have the greatest service or product in the world, if no one supports it, your business will not last long in social media. One way to draw people's attention is to thank them for their support. With that, nobody enjoys seeing their timeline overtaken by a long series of repetitive Tweets. They have no value and will lead to massive unfollowing. 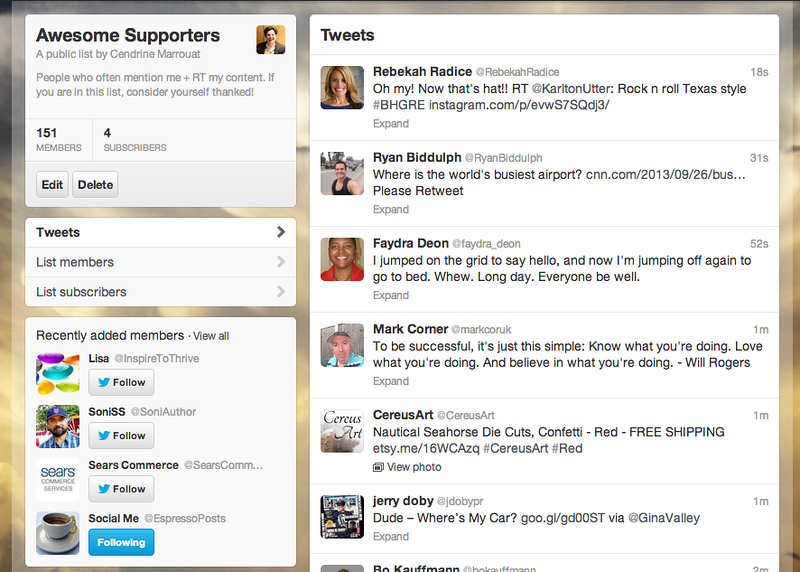 Creating a Thank You List will allow you to acknowledge your supporters without running the risk of alienating others. Remember, though, that lists are not substitutes for real conversations. So, go beyond them. For example, reach out to five or six members of your audience every week. Personalizing connections will always go a long way. You are not the only business in your field to have a Twitter account. In fact, there are probably thousands of them. Use that to your advantage! With a competitor list, you can monitor what these companies and individuals are doing. 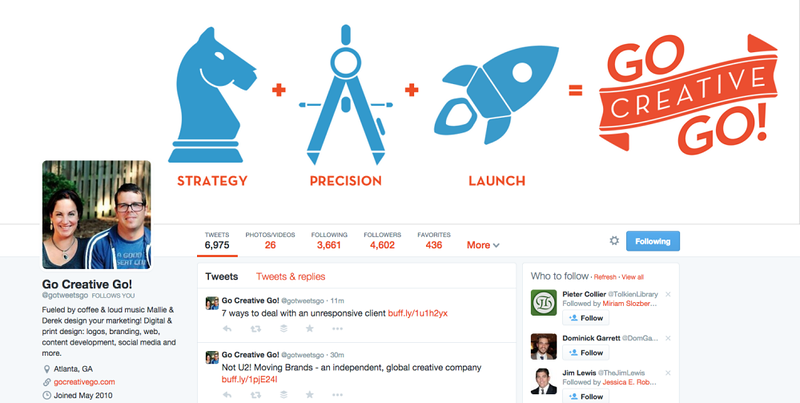 What content do they share and how do their followers engage with it? Even though your audience may be slightly different from theirs, the list will give you great insights into the way those brands work and help their clients. It may even inspire you to try different things with yours! Remember that lists can be private. So, observation can be done without anyone knowing about it. If you know me, you are aware of what I think of brands that use Twitter to blast out constant self-promotional messages. They are a definite no-no. You are on Twitter to serve the needs of your audience and save them time by sharing useful and relevant information. That is how you build trust and increase awareness of your own brand. Monitoring what your customers are doing is very important. That kind of lists will allow you to advise and serve them better. You can also use that information to start relevant conversations with them. Plus, it’s nice for them to know that you are paying attention. Recommendation: Keep those lists private. One of the best ways to increase awareness of your company is to have relevant and reputable blogs and newspapers write about it. Many bloggers, journalists, and reporters are on Twitter. Add them to a Media List to see what piques their interest and the kind of stories they write. The list can be private. Not sure how to pitch to the media? Here are the highlights of a white paper that should help you. Fractl, a marketing agency, asked 20 questions to 500 writers and editors from top digital publications to understand what they expect from content creators and PR specialists. Prior interactions matter – Publishers want you to establish a personal connection with them on social networks or their blogs (64 percent). Stop sending press releases - Now, only 5 percent of publishers want them. Send pitches via email but avoid mass messages. Be concise - The ideal pitch is 200 words and has a short, but descriptive title. Focus on novelty - Publishers want to read exclusive research (40 percent) and breaking news (27 percent). Visuals win the day - Infographics, mixed-media pieces, and high-resolution photos in particular (35 percent). Collaboration is favored (70 percent) - Publishers love options and feeling a sense of ownership over the content they write. Proofreading is a must – More than 8 in 10 publishers will delete your pitch based on your grammar and spelling. The quality of your content is irrelevant. Interested in supporting local businesses while helping people in your area to find great services? Create local lists. They can target specific categories or highlight what you feel is the best your city or region has to offer. If you have followed me for a while, you probably know that Twitter is one of my favorite social media platforms. Not only do many of my leads come from there. I have also met great people, some of whom are now among my best online friends. Others are treasured peers with whom I have partnered several times. With that said, things did not happen overnight. I worked hard to build those relationships. I have spent countless hours in Twitter chats and monitored conversations around my blog and name carefully. Actually, you are wrong. You can only spot half the shares. When they come across content they would like to share, Twitter users do not always hit the sharing buttons on blogs. They prefer relying on a service like Buffer because of its scheduling functionality. And when they do, our Twitter handles often get “axed” in the process. The result? Twitter will not notify us when our links have been shared. 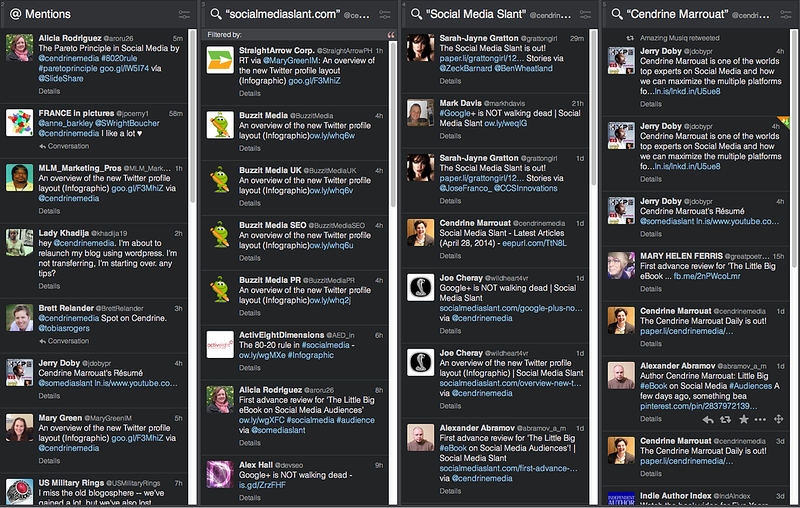 TweetDeck can help you find all the “invisible” mentions on the Twitter-sphere. Yes, you read it right. And it’s actually very easy to set that option in motion. As you can see in the screenshot above, none of the Tweets in the “Social Media Slant”, “socialmediaslant.com,” and “Cendrine Marrouat” columns contain my handle (@cendrinemedia). And yet, if you click on the links, you will land on my blog. The exception is the Tweets from the user whose Paper.li paper has the same name as my blog. However, they do not show up too often, so it is a minor issue. If you write guest posts, you can monitor articles individually. Just enter one permalink or title per column. You have a unique or unusual name? Chances are that people will misspell it. Take advantage of it! For domain names, Domain Name Typo Generator will give you great ideas on what to monitor. Keyword Typo Generator is a solid option for personal names. And why not even keep an eye on conversations around your slogan or the titles of your videos, infographics, and announcements? Surprise the Tweeps who share your content. Start with a “thank you.” If they respond, ask a question. Open the door to a conversation. Some people will stop there. Others will be very happy you noticed them. Do not get discouraged if nobody seems to care at first. It may take weeks before you get one response. However, since so few brands actually acknowledge individual members of their audiences, you may also notice an increase in recommendations or mentions of your blog and/or name in your stream. That’s the little things that make a difference. You can trust me on that one!